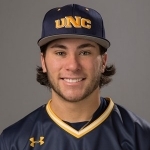 From 2012-2017 I played college baseball for Dodge City Community College, University of Northern Colorado, and the University of Colorado, Colorado Springs where I had time as a starting catcher. In September of 2017, I played and helped bring Surfers Paradise Baseball Club, of the Greater Brisbane League in Australia, their 6th championship. In 131 at-bats my batting average finished at .351, tied as the league leader in home runs (6), finished second in RBIs (38), and had the highest throwout percentage in the league (9 for 30). I returned for the 2018-2019 season with Surfers Paradise and was picked up by the Auckland Tuatara of the Australia Baseball League later in the season. In the summers of 2016-2019 I worked as the bullpen catcher for the Brewers AAA minor league team, Colorado Springs Sky Sox. I take pride in my catching. I’m a hard working ball player. My glove to bag pop time ranges 1.90-2.00 seconds. I block, receive, command the field, and control the pitching staff. I love this game and want to continue to play. 🔴 LIVE: BASEBALL IS BACK! Get over the post-Christmas blues as the Canberra Cavalry host the Auckland Tuatara to begin Round 7!